E2S Warning Signals will be exhibiting at Global Petroleum Show, 7th to 9th of June, Calgary, Canada. The leading manufacturer of audible and visual warning devices will be at the ‘Upper Big Four’ pavilion to launch two new major product families plus the new GRP Xenon beacons for hazardous areas. The new ‘D1x’ family of alarm horns, PA loudspeakers and combined alarm horn/Xenon strobe beacon units has been designed to provide the most effective warning signals available for use in Class I/II Division 1, Zone 1 and Zone 20 environments. With robust marine grade LM6 aluminium enclosures, the UL/cULs approved alarms employ the latest electronic technology and acoustic engineering. The four stage, 64 tone alarm horns and combined units are available with directional flare or 360° sound dispersion radial horns. Also on show will be a preview of the new premium ‘STEx’ family of 316L stainless steel explosion proof devices to IECEx and ATEX approval standards. The ‘STEx’ signals provide high performance audible and visual outputs with an optimal combination of strength and corrosion resistance for use in the harshest of environments. The new ‘GNEx’ GRP Xenon strobe beacons, www.e2s.com/products/range/gnex, add visual signalling to the explosion proof and corrosion resistant GNEx family of alarm horn sounders, PA loudspeakers and manual call points for activation of fire alarms, gas detection and emergency shutdown systems. Suitable for all Zone 1, 2, 21 & 22 hazardous location applications the ‘GNEx’ beacons have extended temperature range with IECEx and ATEX approvals. For applications with high levels of ambient light the GNExB2 beacon is available in 10, 15 and 21 Joule variants producing up to 902cd - a very high output Xenon strobe. The GNExB1, a more compact size version, is a 5 Joule Xenon strobe beacon in a lightweight enclosure. Complementing the family is the GNExJ2 Ex d junction box, which, having multiple cable entries and terminal configurations is suitable for many different applications. All ‘GNEx’ beacons can be supplied as plate mounted assemblies configured with and without an alarm horn sounder or junction box. Ken Martin, President of Brodwell Industrial Sales, E2S’s West Canada distributor and Marcel Minns, Technical Sales Manager from the E2S Houston office, will be at the booth to welcome visitors. E2S Warning Signals, the world’s leading independent manufacturer of audible and visual warning signals, will launch its new GNEx GRP Xenon strobe beacons, www.e2s.com/products/range/gnex, on Booth W1002E at CIPPE 2016 in Beijing, China 29 - 31 March. The new products add visual signalling to the explosion proof and corrosion resistant GNEx family. Suitable for all Zone 1, 2, 21 & 22 hazardous location applications the GNEx beacons have extended temperature range with IECEx and ATEX Ex d approvals. For high ambient light or long distance signalling the GNExB2 beacon is available in 10, 15 and 21 Joule variants producing up to 902cd - a very high output Xenon strobe. The smaller sized GNExB1 is available for where a 5 Joule (up to 117cd) unit meets requirements. Three flash patterns and second stage, set by user, are a standard feature with all GNEx beacons, depending on base model and power (DC or AC) supply. On-site removal and replacement of the lens filter, such as for colour changes, is simple. Polycarbonate, UV stable lenses are available in Amber, Blue, Clear, Green, Magenta, Red and Yellow as separate spare parts. Installation time is minimised by design with the GRP enclosure featuring a threaded flame path, multiple cable entries and a large termination area. Complementing the GNEx range is the GNExJ2 Ex d junction box, which, having multiple cable entries and terminal configurations means suitability for many other applications. Both 15 and 21 Joule versions can be supplied as a plate mounted assembly configured with up to four Xenon strobe beacons with a junction box or five beacons without a junction box. The new Xenon strobe beacon visual signals broaden the GNEx family which includes alarm horn sounders, PA loudspeakers and manual call points for activation of fire alarms, gas detection and emergency shutdown systems. “CIPPE is Asia’s largest trade show for the petroleum industry equipment and we’re happy to come back again this year to showcase our products designed specifically for the needs of the industry” said Colin Tan, Regional Sales Manager for E2S. E2S will also have a preview of the new STEx family of stainless steel enclosure devices plus a selection of other explosion proof and intrinsically safe warning devices from the company’s portfolio of more than 350 different products. 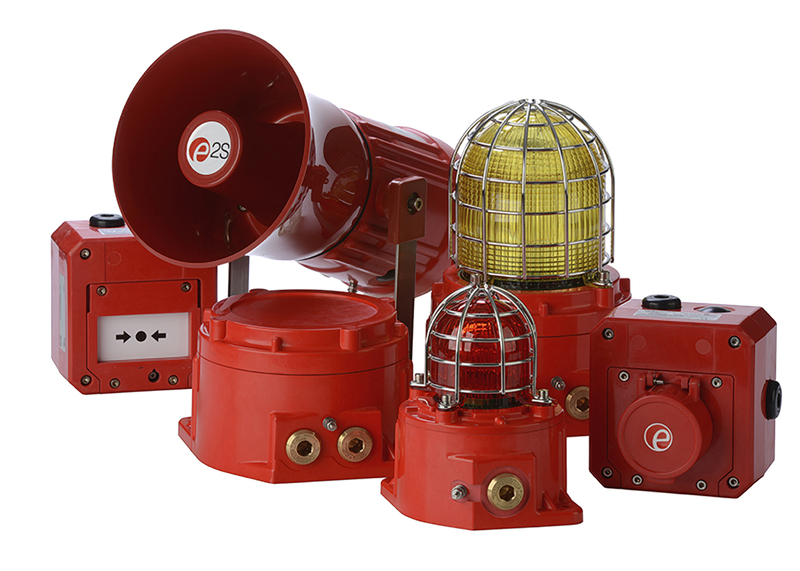 E2S Warning Signals, the leading independent audible and visual warning signals manufacturer, has introduced a SIL 2 version of its flagship BEx range of explosion proof alarm horn sounders and Xenon strobe beacons. The new IECEx and ATEX certified BEx horns and strobes are the perfect solution for designers and integrators of SIL 2 systems; they are designed and tested to ensure a 99.9% reliability rate, bringing plant safety to new levels. To meet the requirements of SIL 2, a combination of software and hardware in the new units accurately monitors and interprets the sound output of the horn or the light output from the Xenon strobe to check it is functioning correctly. The fault monitoring reports back to the control panel utilising either separate fault contacts or by the introduction to the monitoring circuit of a series resistor. Using the series resistor facility eliminates the need for any additional cables and can be used in a standard two-wire arrangement.